WARNING: Follow the links mentioned here with care. 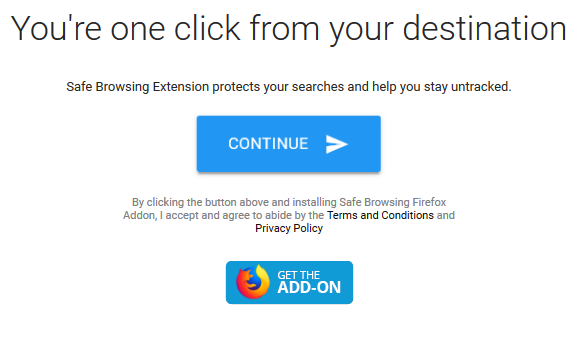 The profile description for new user Solenodon Paradoxus, has a link to his/her blog at solenodus dot com which redirects to reps.appcase.com, which then does a 'Are you a human check' and then wants to install a 'Safe Browsing Extension' into my FireFox browser. Things like these are a big NO-NO in my book. Does someone need to undertake action? Someone needs to undertake action. At a minumum his blog is hacked, at a maximum this is someone with bad intentions. Thank you for letting us know about this. I've edited the links out of the user's profile and have privately let them know about the issue. As far as I can tell from looking at archived versions of the page, the domain was originally actively used by this person, but has since lapsed, so I think this problem wasn't malicious - but certainly something we needed to address. It turned out that the user was unaware that the domain had lapsed, and the mistake was indeed innocent. All's well that ends well. Not the answer you're looking for? Browse other questions tagged support new-users profile-page .